The Open-Hearted Way to Open Adoption: Helping Your Child Grow Up Whole is Lori Holden‘s first book, born from listening to hundreds of people living in adoption — adult adoptees, birth parents, adoptive parents and adoption professionals. Lori was named a Top 10 Must-Read Mom by Parenting magazine and was honored at the annual BlogHer Conference in 2010. She also had an article published in Parenting and in Conceive magazines at that time. Her blog, LavenderLuz.com, has been listed by Adoptive Families magazine, Circle of Moms and by Grown in My Heart to be one of the top adoption blogs. Besides Parenting, Conceive and Adoptive Families magazines, Lori has written for The American Fertility Association, RESOLVE.org and Kaiser Permanente’s Partners in Health magazine. With Crystal, her daughter’s birth mom, she teaches classes on building a child-centered open adoption. Increasingly recognized as an expert in the field, Lori is the National Examiner for Open Adoption and has spoken at BlogHer conferences about Adoption/Loss/Infertility (ALI) issues about authenticity in writing. She is a regular columnist for Mile High Mamas, a Denver Post site. Lori has lived in Japan and in the Middle East, and currently lives in Denver with her husband, Roger, and two children. Her daughter, Tessa, and her son, Reed, continue to teach her every day. 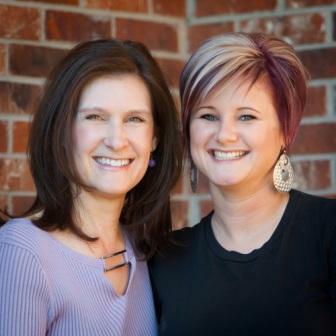 Crystal Hass teaches about open adoption with Lori and shares her invaluable perspective. She is a mom to Tyler, first mom to Tessa and dear family member to the entire Holden clan. Her education comes from the School of Hard Knocks, from which she has enough credits for at least one doctorate degree. She is a stylist at a Denver-area salon/spa. Over the years, Lori and Crystal have forged a relationship that defies definition. “Friend” is inadequate and “sister” is inaccurate. They discuss, set and respect each other’s boundaries, united by their love for a child named Tessa, now a teen. They anchored their relationship in trust from the very early days, as the balance of power shifted from one to the other. They continue to find equilibrium as the years go on. Lori is available to speak at adoption agency gatherings and at adoption-oriented conferences as a speaker or keynoter. Contact her via email.